Announcement Welcome to our shop! We specialize in printable/digital invitations, holiday cards, birthday banners, cupcake toppers and other party coordinates. Current turnaround times is approximately 1-2 BUSINESS DAYS. Business days are Monday to Friday and I work mostly nights. Closed on weekends and major holidays. *PIN 2 of our listings to any Pinterest board and get 10% off your entire order! Just send us the links to your pins through a message here on Etsy and we will reply with your coupon code! Welcome to our shop! We specialize in printable/digital invitations, holiday cards, birthday banners, cupcake toppers and other party coordinates. 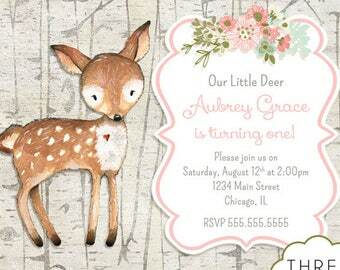 Love our invites -- the service was great and the product came quickly! Thank you!! 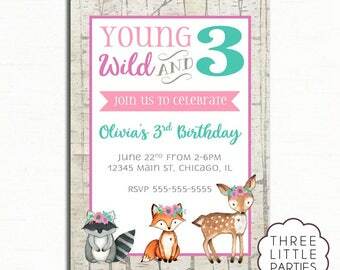 Printable invitations and other printables. My name is Vicky and I'm the owner and designer of Three Little Parties. I live in Indiana with my wonderful husband & our three children. I feel so blessed my shop allows me to have a creative outlet while being able to stay home with my children. Welcome to Three Little Parties. 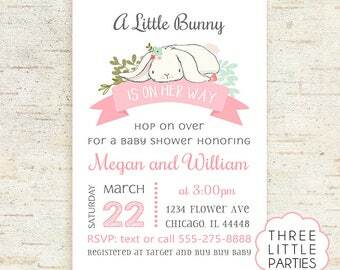 We specialize in invitations, birth announcements, holiday cards and party coordinates. Thank you so much for stopping by! If you like my style but don't see what you need, please feel free to send a message. Due to nature of the product, no refunds will be provided once I begin working on your order. Refunds are only given if the item was purchased and a proof was not sent. Once a proof has been sent, refunds will not be given. You may cancel your order and request a full refund at any time before the proof has been sent to you. To request a refund before the file is sent you can contact us via Etsy private message. Please double and triple check your proof(s) before you approve them. If a proof is approved with a spelling or date error, it will be adjusted at no charge. We will not, however, refund money for files that you already printed or give refunds based on something that was not proofread. When your final proof is approved you accept responsibility for any errors. If you are unhappy with your purchase, please contact us and we will do what we can to make you happy. - We accept payment by PayPal, Etsy Gift Card, and all major credit cards. Payment in full must clear before we work on your order. - E-checks must clear before a proof of the file is sent. - You don't need a Paypal account to proceed with payment. Just choose "check out with Paypal" and then choose "pay by credit card / debit card"
- Proofs are only sent after the item is ordered and paid for. All items sold in our shop will be sent as digital files to your email account. No physical items will be mailed. Three Little Parties will send your first proof on a 1-2 business day turnaround, or sooner. We are on Central Standard Time (CST) & many times work late at night. Timeline begins after your order, cleared payment & all information needed to complete your design has been received. * Please note, all computer monitors display color differently. It is not possible to guarantee the image you see is an accurate representation of how the digital files will look once printed. It is strongly recommended you print one design before having all of the items printed. We uphold legal rights of photographers and authors of images. To use a copyrighted image in your order you need to request a signed copyright release for your records. We take copyright indemnification seriously at Three Little Parties and you (the buyer) agree by placing an order that you have gotten the proper permission to use the image in your design. You agree that you will not hold Three Little Parties responsible for any costs, attorney’s fees, expenses or court judgements resulting from claims or lawsuits made against Three Little Parties for grounds that claim work produces violates any copyright or proprietary right of any person or entity. COPYRIGHT: All designs are my own work or have been purchased with a license for use in my shop. Please do not copy them. They are for your personal use only and may not be reproduced, shared, sold, or used commercially without express written consent. We do not offer printing services. The digital files can be printed 1) at home, 2) at copy centers (OfficeMax or Staples), 3) at a professional print shop, 4) at a photo center (Costco, Walgreens, Walmart and CVS) and 5) online (Shutterfly.com and Mpix.com). You may also email the digital invitation. -We recommend you print on a white cardstock. Do I need a jpeg or pdf? - A Jpeg is basically a photo file. This is best if you plan on printing at a photo shop. - A PDF is best when printing at a copy center and usually at home. If ordering a 5x7 PDF you will receive 2 invitations per 11x8.5 page. If you order a 4x6 PDF you will receive 3 invitations per 11x8.5 page.This is done so that you can print multiple invitations at a time from one sheet of heavy white cardstock and save on paper! Instant Download means you will be able to download the files as soon as payment is cleared. go to "YOU" > "PURCHASE & REVIEW". Find the item(s) you have purchased, and click the "Download File" button and save the files to your computer. Can I view a proof prior to ordering? No orders will be filled until a completed order & payment is received. How do I give you my information? Please provide the order details in the NOTE TO SELLER section at checkout or send it in a private Etsy message https://www.etsy.com/conversations/new?with=threelittleparties. I forgot to give you my information during checkout, what should I do? Where do I send you the picture? Please be sure to submit high quality photos in JPEG format. Three Little Parties is not responsible for low-quality/resolution photos. By purchasing, downloading and printing any photo invitations, you are agreeing that you own or have exclusive right to use the photograph e-mailed to me. You are also agreeing to take full responsibility for any misuse or copyright infringements. If they contain a watermark (photographer's logo), you will be asked for a print release. I am not able to crop the logo out. If you send me the same photo back with the logo cropped out, you will still need a print release. Photos you should be 300dpi or higher. Please send the Original, unedited photo. Three Little Parties is not responsible for low-quality/resolution photos. Camera phone pictures that have a filter or have been edited with an app usually do not work because the resolution is too low. No, we complete the formatting for you and send a file ready to print. How do I print glitter or gold foil designs? Your printed design will not contain real glitter or pressed gold foil, but rather a quality high resolution digital graphic that will print to look like glitter or pressed gold foil. There will be no actual pressed gold foil or actual glitter on the printed card. Print on a pearl white/metallic cardstock, soft sheen or glossy cardstock or photo paper for best results.